This entry was posted in LEGISLATION, Liberty & Freedom Room, Pregnancy and birth, Vaccine Injection Room and tagged Arizona, excipients on January 29, 2019 by Editor. Orthomolecular review of Vaccines: What Else Comes Through The Needle? Excipients in vaccines are chemicals that are not the main active ingredient, but are added to vaccines for several purposes. Preservatives are added to prevent contamination, and adjuvants are added to “killed virus” or subunit vaccines, and are designed to make the antigens more reactive and have a longer duration of action. This seems to be a good idea, but unfortunately there is a bad side, particularly to the two most popular additives: thimerosal and aluminum. Thimerosal, a preservative, is a mercury compound, added to vaccines to kill any “live viruses,” fungi, and bacteria in the vial. Aluminum (as aluminum hydroxide or aluminum phosphate) is an adjuvant in vaccines meant to boost antibody response. Both of these metals are regarded as environmental toxins. This entry was posted in Pregnancy and birth, Vaccine Injection Room and tagged excipients on August 14, 2018 by Editor. The FDA has published conclusive proof on their website that the DTap vaccine causes autism. 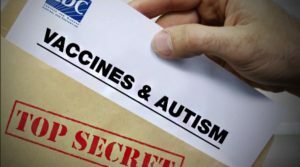 According to the FDA’s online Biologics Blood Vaccines document (between pages 6 to 11), a vaccine manufacturer admits on its package insert that their vaccination can cause autism as one of many adverse reactions. VLA COMMENT: Aside from excipients in vaccines such as phenol, formaldehyde, aluminum, polysorbate 80, mercury, ethanol, herein we list the ingredient in what is usually just listed as “the medium…Mueller and Miller medium and Stainer-Scholte medium. Such ingredients as listed above and within the mediums, as well, need a fully mature Cytochrome P450 (detox liver enzyme familiers) to rid the system of these toxins. All children do not have mature Cytochrome P450 until at least 3 years old and 10% for example of Caucasian are non-metabolizer of the major detox pathway Cytochrome p450 2D6 and become damaged when vaccinated and psychotic when given many of today’s modern drugs. There is an easy test for metabolism but it is not “standard of care” because the pharmacuetical company would loose billions of dollars if the public knew. On the other hand medicaid, medicare and insurance companies would save billions of dollars if the test became standard of care. glucose, sodium chloride, sodium phosphate dibasic, monopotassium, phosphate, magnesium sulfate hydrate, ferrous sulfate heptaphydrate, cystine hydrochloride, tyrosine hydrochloride, urasil hydrochloride, Ca-pantothenate in ethanol, thiamine in ethanol, pyridoxin-hydrochloride in ethanol, riboflavin in ethanol, biotin in ethanol, sodium hydroxide, beef heart infusion (de- fatted beef heart and distilled water), casein [milk protein] solution. The vaccine is formulated without preservatives, but contains a trace amount of thimerosal[(mercury derivative), (≤0.3 μg mercury/dose)] from the manufacturing process. Each 0.5 mL dose also contains, by assay, not more than 0.170 mg of aluminum and not more than 100 μg(0.02%) of residual formaldehyde. The vaccine contains gelatin and polysorbate 80 (Tween-80), which are used in the production of the pertussis concentrate. This entry was posted in Medical information and Research Data, Pregnancy and birth, RESEARCH, STUDIES, DOCUMENTATION, Vaccine Injection Room and tagged cyp 450, excipients, medium, VACCINE EXCIPIENTS on March 29, 2017 by Editor.